A city that dates back centuries, Savannah is steeped in history and offers a plethora of interesting places to see and learn about. For the best way to see them all, take a ride on the Old Town Trolley. This fully narrated tour, led by a local historian, will transport you past more than 100 of the most significant places in the city. 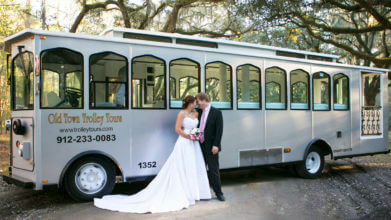 You will have the chance to get off and linger at any or all of the stops including the Kehoe House, Juliette Gordon Low Birthplace, River Street, Forsyth Park, Cathedral of St. John and more. Hop off at stop 13 and indulge in a decadent southern meal at the Lady and Sons Restaurant, Paula Deen’s famous eatery. While at stop 7, stick around and experience the new American Prohibition Museum or have a drink at the speakeasy inside. There are trolleys coming and going all day, so you can take your time enjoying all of the sights. For those who enjoy art and other cultural pursuits, Savannah delivers in many ways. The Telfair Museums, which are some of the most popular art venues in the city, are actually three different museums: the Telfair Academy of Arts and Sciences, the Owens-Thomas House and the Jepson Center for the Arts. Each offers a large collection of artwork, which when added together total more than 4,500 pieces. The works include paintings, sculptures and more. The Jepson, a contemporary building that opened in 2006, features traveling exhibitions, outdoor sculpture terraces, a children’s gallery and more. Come hungry and you’ll be happy. Savannah boasts an eclectic assortment of palate-pleasing dining choices. Whether you want to dig in to a traditional homemade meal or delight in contemporary international fare, Savannah’s got it all. Check out the Olde Pink House, known for its modern take on classic southern dishes and historic ambiance. The brainchild of Georgia’s founder Colonel James Oglethorpe, the original four squares in the city were laid out beginning in 1769. They were meant to provide open spaces for the colonists to perform military exercises, but as time went on, the city expanded and today there are 24 squares in Savannah. Each was named after someone of historical importance to the United States or Georgia, including presidents and military leaders. A visit to any of Savannah’s charming squares is certainly a must do. Many of them have monuments, statues, plaques and fountains, offering a peaceful retreat among natural beauty in the heart of the historic district. As one of the south’s most treasured coastal cities, it’s no wonder that Savannah’s Riverfront is a favorite spot for locals and visitors. The Riverfront district is not only home to many historic buildings and sights, it’s also full of chic shops, numerous fine and casual restaurants and entertainment venues. The district includes River Street, Bay Street and Hutchinson Island. When you go, be sure to check out Factors Walk and Factors Row, the ancient red brick buildings that were once the hub for Savannah’s cotton industry. Savannah Is Feeling The Love!